All of our classes are centered around the needs of the kids enrolled. Therefore, each class will begin with a sensory "warm-up" and include sensory breaks as needed, for each individual. There is street parking, as well as a lot behind the studio. Students will learn the basics of theater and improv through simple games and scene work while gaining social skills and becoming better social thinkers. Exercises will be centered around expanding expressive and receptive language, reading emotions, reading social situations, looking out for social cues, handling conflict, being part of a team, and working towards common goals. Each class will incorporate sensory activities throughout to keep kids focused and on task. Each class will have 2 instructors trained in our improv program, along with 1 assistant. Class size will not exceed 8 children. Students will build upon their improv skills and focus more on scene work and playing characters. As a team they will learn to express complex ideas and feelings. Exercises and games will be more complicated and will help students expand their conceptual thinking. We will "get out of our heads,” team build, and create dynamic and funny improvised stories as a group. Each class will have 1 instructor and 1 assistant. Class size will not exceed 8 children. 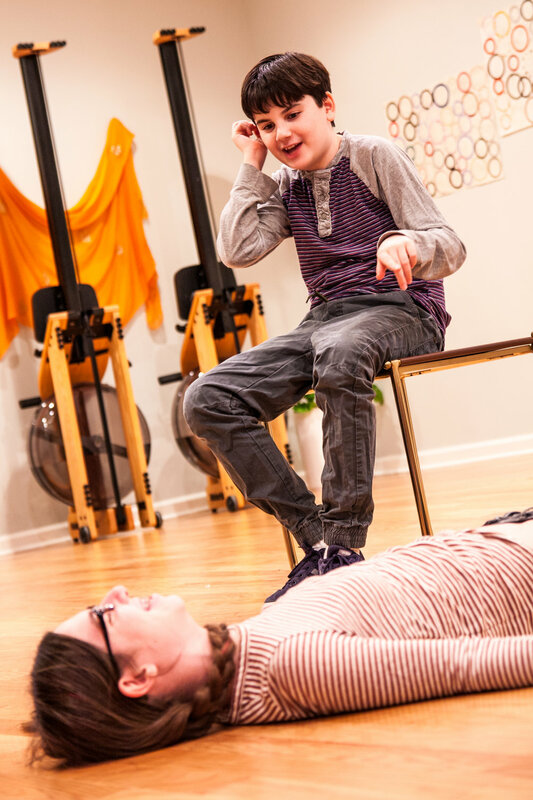 In this class, kids ages 15-18 will discover a love of improv through social skills building games, as well as working through real-life scenarios they come across every day. Through sharing and role playing, kids get to use their own experiences to inspire where their improvs go! All we ask is that the kids come in willing to take chances and try new things! Teen Improv runs for 10 weeks, 1 hour per class. A multidisciplinary class for ages 9-12 focusing on singing, dancing, and acting! This is a highly collaborative class, that will focus on team-building through improvisation, vocal performance, and dance technique. Kids will work together to find their voices and explore musical theatre alongside theatre professionals in a safe and fun environment! Each class will have one teacher and one assistant. Class will not exceed 10 children. Musical Theater will run for 10 weeks, 1 hour per class. Kids ages 7 & above will have fun and find their calm with Miss Patrice. Students will learn different techniques to help with concentration and focus while building body awareness and encourage self regulation and self esteem. This class will include a combination of breathing and mindfulness exercises, stretching, yoga poses, sequences, games,and a final relaxation. Yoga will run for 10 weeks 45 minutes per class. Students will learn the basics of drawing. How to create (or breakdown existing) characters to create simple line drawings. The workshop will focus on using visual story telling through illustration and cartooning as a means of personal expression. 1 instructor & 1 assistant. Maximum 6 students. Young comedians, ages 9 & above can try their hand at writing and performing their own comedy routines. Seasoned comedy veterans will be on hand on this one time workshop to help teach the art of joke writing, and improvisation resulting in getting the act up on its feet. 1 instructor & 1 assistant. 6-8 students. Kids, ages 9-17, can Find their Voice in this workshop that allows a child to be heard, not necessarily seen. Working with professional voiceover teachers as well as actors, each child can find their own voice to help them express themself. Cartoon characters, puppets, whatever their muse, we can help find the voice to match. Each class will have 1 instructor and 1 assistant. Maximum 6 students. Our summer programs are designed for you to customize your child’s experience by choosing which classes and sessions are the best fit. We offer Improv, Creative Expression, Musical Theatre & Life Skills programs over the summer. Register for one class, or more!